Mrs. GeoK and the GeoKids have been students of taekwondo since 2002. In addition to learning practical self-defence skills, taekwondo provides a great mix of cardio, flexibility and balance training while improving overall conditioning. The sport is multi-dimensional and requires skills development across four main areas: self-defence, poomse (set patterns of basic attack and defence moves), sparring and board breaking. It’s important to train in all these areas to progress to the black belt level, but the Olympics currently only includes taekwondo sparring. In addition to the fact that taekwondo is a multi-dimensional sport, it appeals to this family for a couple of other important reasons. 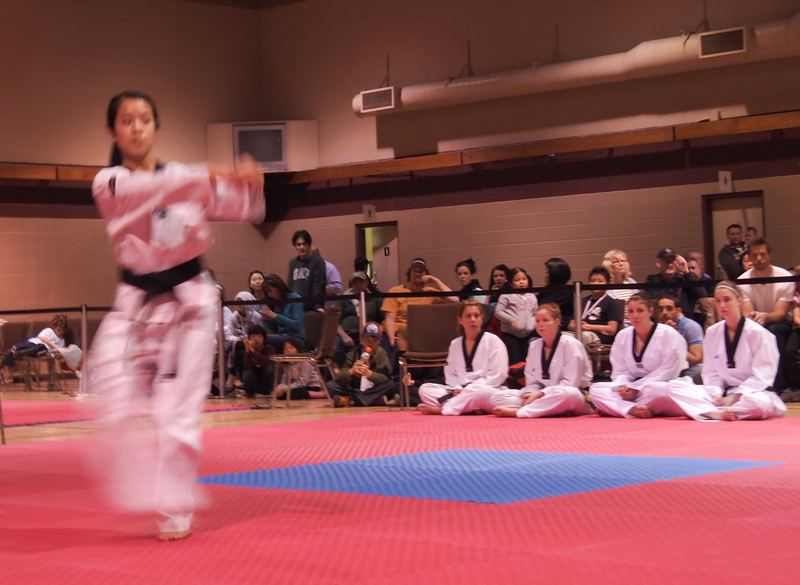 First, our taekwondo club, Calgary Taekwondo Academy, has a number of “open” classes on the schedule, which means all of us can train at the same time. There’s no need for Mom or Dad to drive the kids to their activity and then sit around and wait for them to be done. We can all stay fit together! Second, the sport of taekwondo is framed by a number of important tenets that apply both in the dojang (training studio) and daily life. These tenets are: Courtesy, Integrity, Perseverance, Self-Control and Indomitable Spirit. From a parent’s perspective, it’s great to find an outside activity that reinforces some of the key character traits we work hard to teach at home. 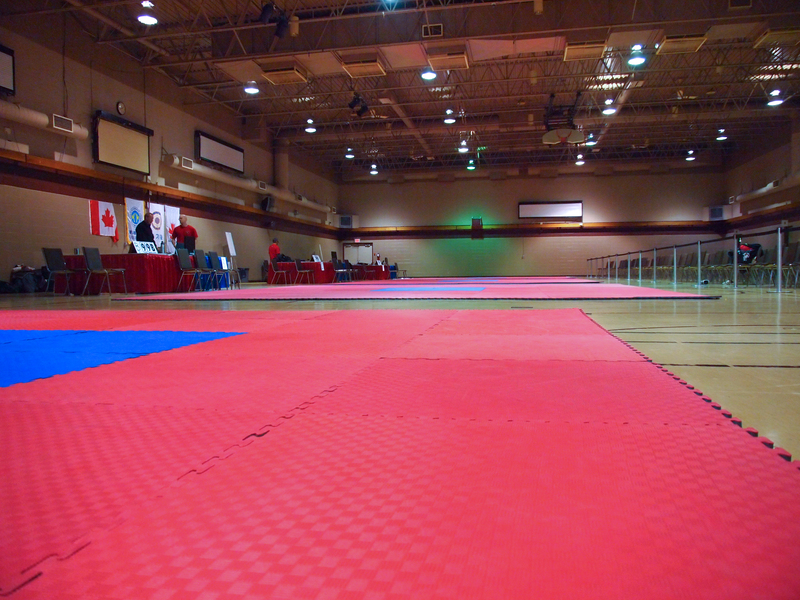 Every year, Calgary Taekwondo Academy hosts the Western Canadian Tournament of Champions. The 2012 tournament was on Saturday, May 5th and, as usual, we volunteered to help out. Our primary duty as tournament volunteers was to keep one of the competition rings running smoothly throughout the day, but we brought along a camera to try to capture the feel of the day. It’s clear from some of these that we should have packed a faster lens, but fortunately, this week’s WordPress Weekly Photo Challenge theme is “Unfocused” so consider this post as doing double duty! By 8:15 Saturday morning, ring set up was complete, the scoring systems had been tested and the sound system was operational. Competitors and their families were starting to arrive and colour-belt line-ups got underway shortly after nine o’clock. The medal presentation table was all laid out by 8:30. 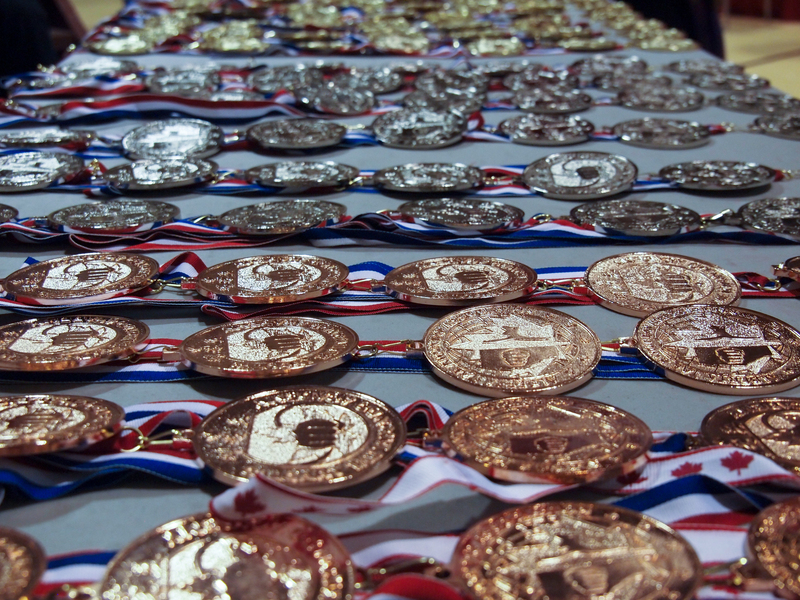 Small division sizes, especially for younger competitors, means that many competitors go home with at least one medal. Medals are awarded for both poomse (set patterns) and sparring. 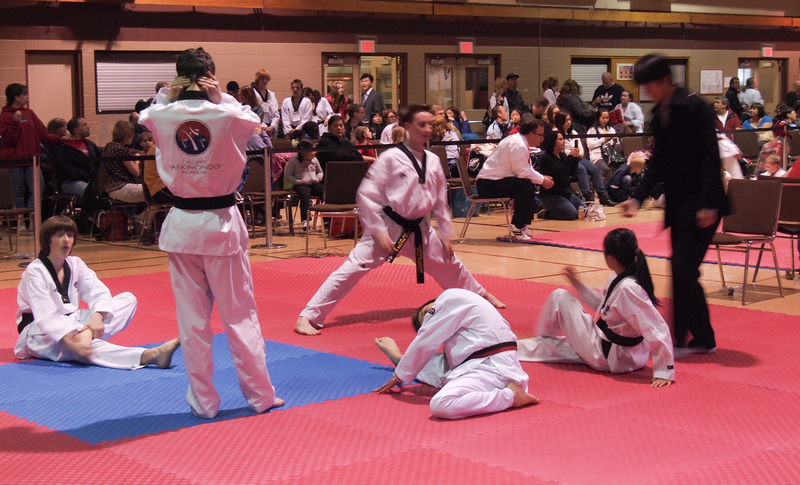 After volunteering all morning, our black belt students changed into their competition uniforms and ran through their usual warm-up routines: a bit of cardio followed by a thorough stretch. After stretching, warm-up continues with a run-through of the assigned poomse (set pattern). The rules for poomse (set patterns of attack and defence moves) have changed significantly in the past year. Some of our students have had to learn several new patterns and all of our students are working to refine their motions to comply with the World Taekwondo Federation standardized motions. Head shots trigger a lot of debate, especially in the context of all the research findings coming out re: long-term brain damage that can occur as a result of repeated head shots, whether in football, hockey, boxing, taekwondo or some other sport. 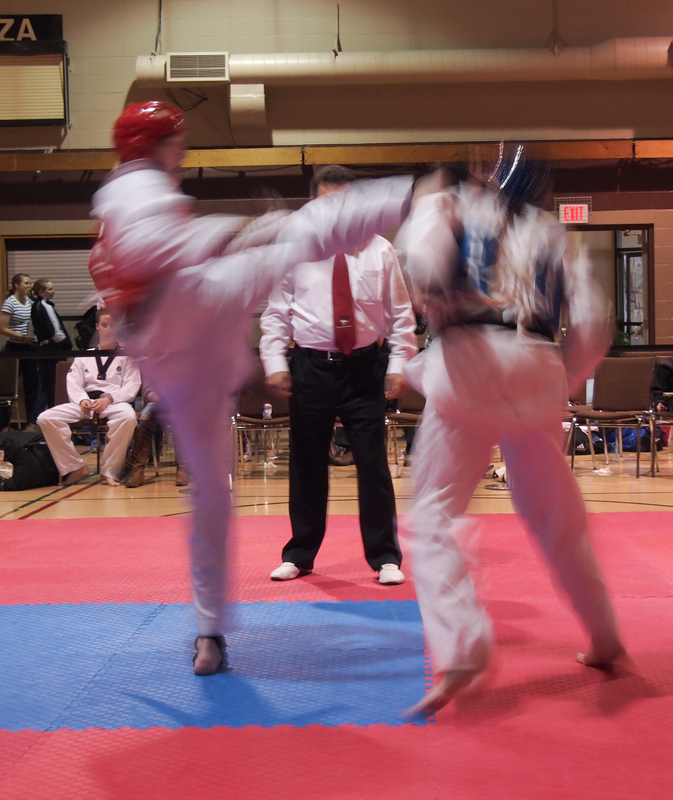 Head shots (kicks, not punches) are an integral part of taekwondo sparring at the black belt level when players are 13 and older. All players wear mouth guards and padded helmets. To reduce the risk of brain injury, players don’t make head contact while training. 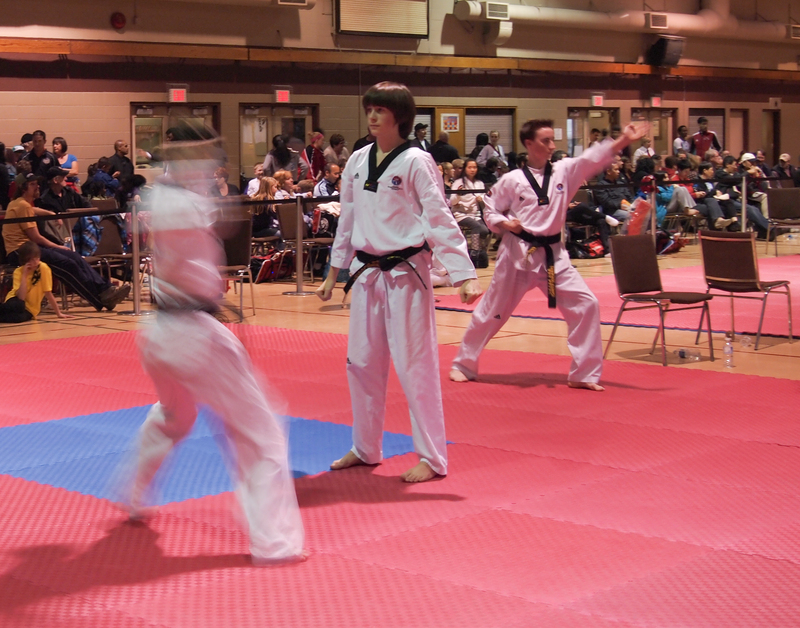 A student from Calgary Taekwondo Academy fought in the last sparring match of the day. Since the other rings were already torn down, most of the volunteers and many of the other students from our club took a ringside seat to cheer on our player. I’m taking my eldest son (age 4) to a birthday party this weekend, which will be at a Taekwondo centre. It will be his first experience. Will report back next week. Our “Little Tiger” students usually start at age 4 or 5, taking 2 thirty minute classes per week. I haven’t heard of a taekwondo birthday party before – interesting business idea. Looking forward to details from this coming weekend!